2015: a new year. A fresh start. An opportunity to pursue our mission to save animals everywhere with renewed vigor. And, while the saying goes, "out with the old and in with the new," our dedicated team of animal professionals has a list of work from 2014 that remains outstanding-and we don't believe in unfinished business! 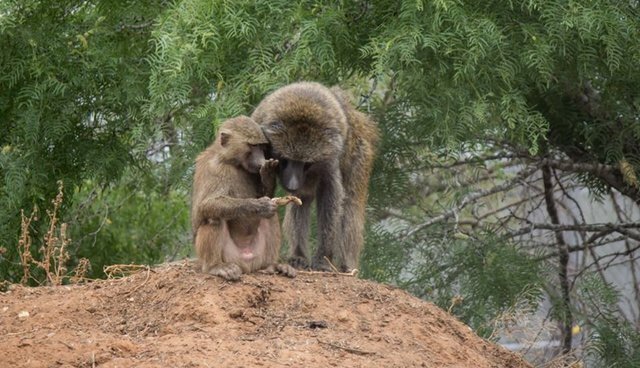 Does it seem sensible that a baboon in a Lebanese zoo could be imported to America for display in another zoo or a biomedical research lab, but not to the Born Free USA Primate Sanctuary for lifetime care? It doesn't to me. Current Centers for Disease Control (CDC) regulations allow the importation of primates for "bona fide scientific, educational, or exhibition purposes," which excludes sanctuaries, unless they are licensed exhibitors. Born Free believes that all animals deserve a second chance-including primates in need of rescue overseas. And, if a sanctuary in America (that's accredited by Global Federation of Animal Sanctuaries [GFAS]) can take them, it absolutely should be able to. And, while we continue to rescue monkeys in need, we must also ensure that they aren't bred or imported for the pet trade in the first place, as this exacerbates the problem. So, we're continuing our work to pass the Captive Primate Safety Act, which would shut down the interstate commerce in primates as pets. Monkeys belong neither in our bedrooms nor our backyards. Hopefully, in 2015, we will replicate the success we had a decade ago when the Captive Wildlife Safety Act was signed into law, prohibiting trade in big cats as pets. Building on our groundbreaking Victims of Vanity trapping investigation, we will continue our effort to stop barbaric trapping in America, as well as the ugly fur trade. The Refuge from Cruel Trapping Act will stop the most egregious forms of wildlife trapping in the National Wildlife Refuge System-a massive network of federal lands that certainly, as its name indicates, should provide refuge for wild furbearers... and not become a killing field. And, in an effort to secure a viable future for a significant number of imperiled canids and felids overseas, we will work hard to pass the Rare Cats and Canids Act, establishing a federal fund for conservation projects to save these species. Born Free has so many projects around the world to spare lions, cheetahs, wild dogs, and others from the downward spiral to extinction, and we (and others) need financial support to make this work a success. We're busily working to pass a number of state initiatives, as well. Exotic pet bills that cover a range of restrictions (from completely banning exotic pets to tightening up loopholes in existing laws) will be reintroduced in Alabama, Illinois, Kansas, Missouri, and Wisconsin. Though they failed to pass through the state legislatures in 2014, we'll encourage legislators to prioritize these important measures this year. Ivory bills will also be reintroduced in California, Hawaii, and Massachusetts. Building on our momentum of recent ivory and rhino horn regulations (both at the federal level and with major successes in New Jersey and New York), we will lobby several state legislatures to pass their own wildlife trade bills. Across the country, we will redouble our efforts to ensure that these bills are as strong as possible so that the U.S. market is no longer a significant contributor to the poaching crisis. It's hard work, but we won't give up. The New Year gives us the chance to advance this legislation as never before. 2015 may just be our best year yet.